Vale of Atholl Country Cottages are located just off the A9 north of Pitlochry, signed Blair Atholl B8079. On entering the village you will see our signs: we are on Invertilt Road, known locally as Golf Course Road (behind the Tilt Hotel). 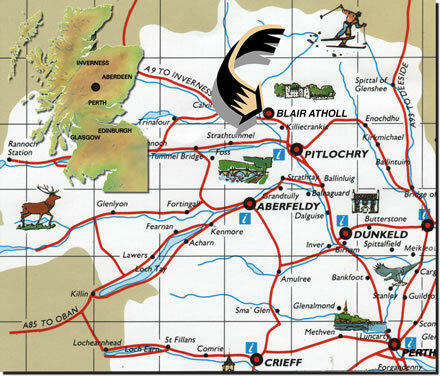 Located in the geographical centre of Scotland, Blair Atholl is ideally located for touring the central highlands. It is within easy reach of the Tummel Valley, with the famed Queen's View, and Loch Rannoch. A short trip north takes the traveller into the Spey Valley and on to Aviemore and Inverness while eastwards leds you to the Braemar, Balmoral and Ballater.